The Camco Marine Dinner Set includes place settings for four bowls, salad plates and dinner plates. 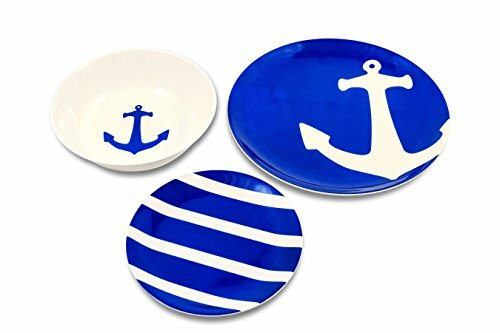 The bowl is white with a navy blue anchor design, the small plate is blue and white striped and the large plate is blue with a white anchor design. The durable dinnerware is great for boats, RVs, and camping. The Marine Dinner Set is easy to clean and top rack dishwasher safe, and BPA free. Do not use in the microwave.